Seroj Avoyan is a world class Armenian Dhol drum virtuoso whose fingers move with such dexterity they are a blur to the eye. Only the human ear can pick up the beauty of the stunning rhythmic beat produced by his hands. So gifted, he has performed on stage with Yani and was a featured solo performer at the Armenian Music Awards in 2002. That same year, Seroj had a second thrill: the birth of his Brian. But within days, doctors heard something wrong with beat of Brian’s heart. He was born with a life threatening congenital heart defect that required emergency surgery six days after birth and open heart surgery three weeks later. “It was terrible,” says Ruzan, his mother. The defect, critical pulmonic stenosis, affects the leaflets of the pulmonary valve, making it difficult for blood to flow from the right ventricle to the lungs. He also had an Ebsteinoid Tricuspid valve, a structural insufficiency that prevents the valve from closing tight, allowing blood to leak backwards. But recently, Brian, now 11, underwent a rare pediatric transcatheter double Melody valve procedure, the first ever performed at Children’s Hospital Los Angeles. The procedure, first performed in Germany in 2011, has corrected both defects and instilled Brian, a young swimmer and martial arts aficionado, with newfound energy that was in short supply earlier this year. Brian just recently returned to Children’s Hospital Los Angeles for his first check-up and he is recovering great, says Dr. Ing. “For the foreseeable future, I believe Brian is safe from needing another surgery,” Ing says. That is wonderful music to his mom and dad’s ears. Brian is a tough kid, having endured six previous heart surgeries, including an open heart tricuspid valve replacement at age four. Brian progressed in the following years but more than a year ago he started feeling sluggish compared to his friends. There was a medical explanation: He was outgrowing his leaky replacement Tricuspid valve, which was causing the right side of his heart to expand. This was to be expected as his heart outgrew his replacement part. “He kept saying, ‘Mom, why am I getting tired?’” his mother, Ruzan, recalls. Brian, an active swimmer and martial arts aficionado, never seemed to have energy. “He would play with the other kids and always get tired first,” she says. Tests on Brian’s heart in 2012 showed his heart function was decreasing and doctors had only a handful of options. At some point, both his pulmonary and tricuspid valves would need to be replaced, potentially with open heart surgery operations. Or doctors could consider a relatively new cardiac catheterization procedure that could take care of both valves at once, without opening the chest. Brian’s team at Children’s Hospital Los Angeles opted to do the transcatheter double Melody valve implant. 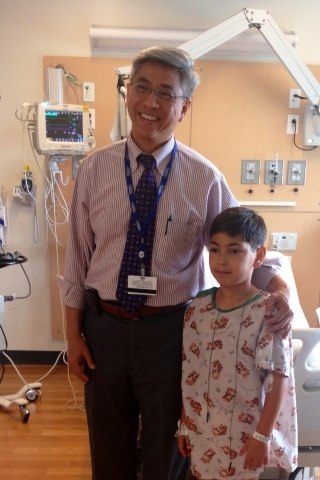 Brian’s cardiologist at Children’s, Matsato Takahashi, reached out to Children’s Hospital Los Angeles Heart Institute’s new recruit, Pediatric Interventional Cardiologists Frank Ing, who specializes in complex catheterization procedures. Dr. Ing, teaming with Cardiologist Cheryl Takao, was optimistic a transcatheter double Melody valve implant could do the job, even though it was only recently perfected for children in the past couple of years. Dr. Ing is one of a handful of physicians nationwide who has performed the procedure numerous times. He was recruited by Children’s Hospital Los Angeles last September from Texas Children’s Hospital and has been breaking new ground at Children’s Hospital using pioneering catheterization stenting and Melody valve implant procedures, which are less invasive than open heart surgery. “Recovery time is much faster,” he says. Dad Seroj Avoyan, a colon cancer survivor who has battled serious health problems himself, feels uplifted by his son’s progress. “My son is an inspiration,” says Seroj.